It’s Friday and I’m feeling wonderfully indulgent–I have a whole day to stay home and write. My dog is beneath the dining table where I sit facing the broad window with its view of my yard filled with 8-foot sunflowers bending in the Oklahoma wind as hundreds of finches cling to the stalks, pecking at seedheads. So determined. My friend Becky calls this backyard theatre. She writes to it too, from an upstairs corner window in a Victorian house in upstate New York, at a desk draped with cats, their tails curling around her stacks of books. I look at my stack of books. After years of this work I’m still seeking the right sort of stack, one that isn’t too tall (tempting me to allow the reading to overtake the writing) but that can remind me, in a collegial way, about the people and ideas that I’ve been wanting to bring into focus during today’s writing. The sample chapter is building on that basic idea: that long-term teachers of composition have pedagogical foundations that inform our work–theories, principles, practices–as well as heartfelt aims that keep us passionate and questing to get better. In our work on the second edition to GCP Amy, Kurt, and I found that it can be surprisingly challenging to connect the dots between those deep pedagogical aims and the assessments we use in our classes. We have learned a lot, as a field, about how to respond to and assess student texts. But how can you tell whether a student has learned about, say, the power relationships inherent in literacy practices? How can you tell whether a student has become more comfortable with ambiguity or more adept at problem-solving? And if your institution claims a culture of transformative learning, how do you know a student has done some of that in your composition course? We have a few answers to those questions, but even those of us who geek out on such things as integrative learning portfolios know how tricky it can be to consistently assign, evaluate, and communicate progress–especially regarding the hard-to-assess goals that, paradoxically enough, are often the things that make us so passionate about teaching writing in the first place. So I sit at my desk, mapping out a new syllabus, reviewing the ever-growing list of institutional, departmental, and programmatical learning objectives I’m supposed to address in my 16-week intermediate composition course, deciding how many of my own learning objectives I should add to that list–the things I believe I can uniquely give my students and want to be sure they’ve gotten. Things like the use of digital storytelling for critically reflective learning throughout the course–a habit of mind and situated practice I’ve been developing for a decade or so as a way to help community-engaged students be more intentional and resourceful in the field. “Intentionality” or mindfulness is not, officially, an institutional, departmental, or programmatical learning objective. Nor does it appear on the end-of-semester IDEA course-evaluation form. But I teach it. Because it matters. 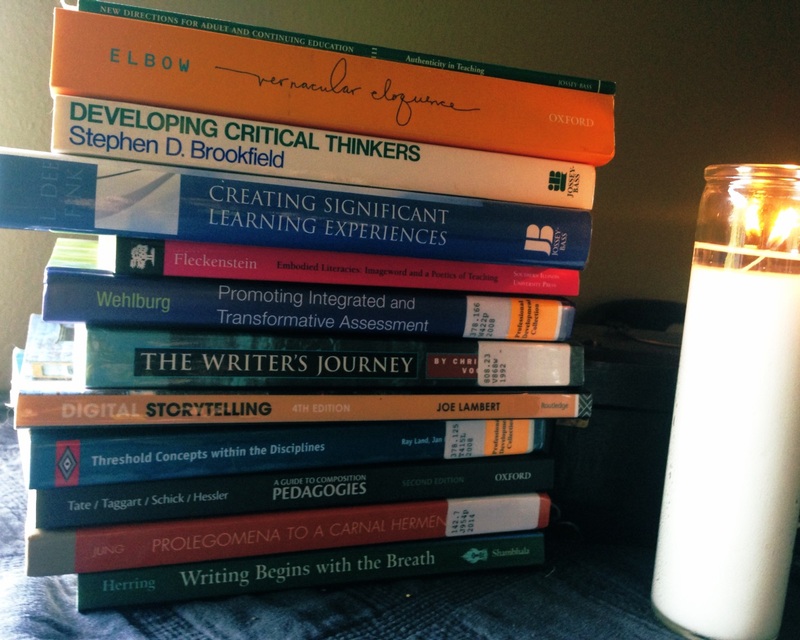 And I turn to my stack of sources–people like Stephen Brookfield, Dee Fink, Kristie Fleckenstein, and Peter Elbow–reflecting on what they’ve taught me about the praxis and poetics of teaching and learning, challenging me to surface those things in my students’ work and in the ways I respond to it and to them.